The Last Man To Die For A Mistake? 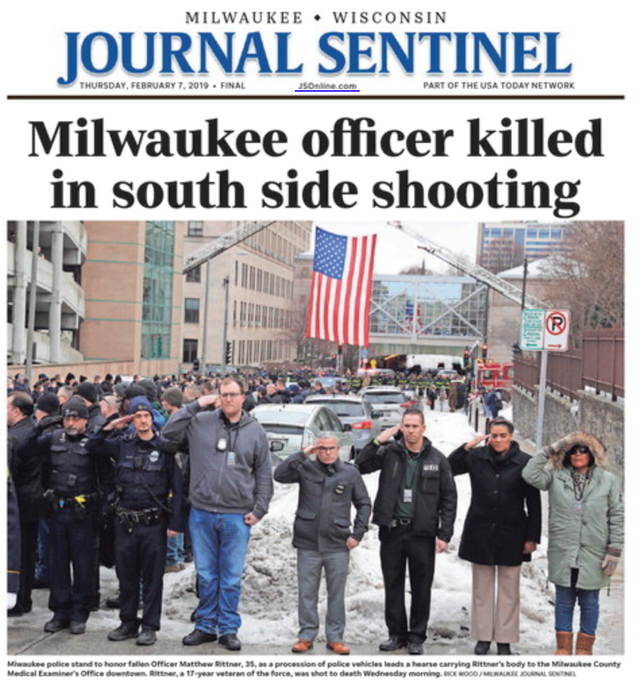 In my recent article: Pulling the Drug War Thread, I reviewed the harms and collateral damage from the Drug War here in Milwaukee. The tragic death of the latest victim, MPD Officer Matthew Rittner, is being reported here absent the context of the enforcement of drug prohibition. The Criminal Complaint against Jordan Fricke begins with the confiscation of a gun from a convicted felon, who was in possession of an unspecified quantity of cocaine and ecstasy. It is true that the arbitrary criminalization of certain “controlled substances” has created a dangerous street marketplace were both sellers and buyers often arm themselves for protection; there is no recourse to the courts for a drug deal gone bad. If we pull the thread of this Drug War story we again find the confluence of drugs and guns. And we also see the practice of using confidential informants to setup the target. Who is this informant and what is the nature of “the deal” made with the Police for participating? We see controlled buys by the confidential informant of $20 and then $40 worth of cannabis used as evidence that Mr. Fricke was “Maintaining a Drug Trafficking Place” and to subsequently request the search warrant. Although he was not charged with any crime specific to buying or selling firearms, the suspicion that he was involved in illegal arms trafficking was also used as justification for the search warrant. Tragically, via a combination of lack of imagination, blind order following and utter disregard for the natural right of Mr. Fricke to own weapons and to possess, consume and distribute the flowers of a plant, the MPD decided that a no-knock assault on his home was the best way to proceed. Imagine yourself at the door with the battering ram: You know the person inside is likely to be armed and may respond with force to your invasion, yet, because of your training and subservience as an order follower, you abdicate the exercise of your own conscience regarding the legitimate rights of the human being on the other side of the door and agree to be the tip the of Drug War spear. This violent attack and tragic death are the disastrous outcomes of the illegitimate exercise of The State’s monopoly use of force in the War on Drugs. Is this the only way that this “coach potato” could have been approached? Hello @paulmozina! This is a friendly reminder that you have 3000 Partiko Points unclaimed in your Partiko account!